Minnesota says no war threats on Korea | Fight Back! Minneapolis, MN — 80 people attended a forum on U.S. war threats and aggression against north Korea, Oct. 24. The event was organized by the Minnesota Peace Action Coalition and took place at the University of Minnesota. One of the speakers, Sharon Chung, emphasized the U.S. role of aggression and war on the Korean peninsula when she reminded the audience, "the Korean War begins and ends here in the U.S." As would become clear from all of the speakers, and the discussion that followed, the Korean War has never ended because the U.S. continues its aggression and provocations against north Korea, and refuses to sign a peace treaty. Highlights of the forum included three outstanding speakers who all have significant experience in addressing U.S. aggression on the Korean peninsula. Sharon Chung moved to Minnesota a year ago and is a supporting member of Nodutdol for Korean Community Development and on the Korean Education and Exposure Planning Team. Roy Wolff is a member of Veterans for Peace Chapter 27 and a U.S. Army veteran who was stationed in South Korea for 16 months (1955‐57). Wolf has traveled to both north and south Korea in the years since he was in the U.S. Army. Lastly, the panel included Christine Ahn, who video conferenced in from Hawaii. Ahn is a founder and International Coordinator of Women Cross the DMZ, and a co‐founder of Korea Policy Institute, Korea Peace Network and Korean Americans for Fair Trade. She is a policy analyst with expertise on Korea, globalization, militarism and women's rights. 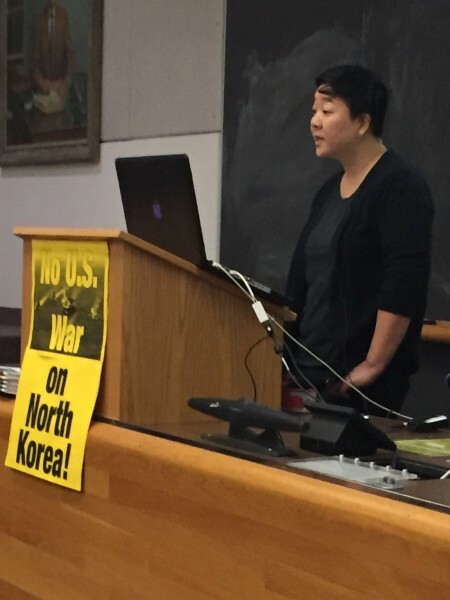 Beginning the forum, Sharon Chung stated Western news media regularly spews distorted information about a “crazy north Korean dictator trying to blow up the world with nuclear weapons,” while ignoring the truly provocative actions coming from the U.S. government. She condemned actions like the U.S. and south Korean joint war exercises which simulate a nuclear war and assassination strikes on north Korea, and the forced and undemocratic deployment of the THAAD missile system. Chung condemned the hypocrisy of some media’s portrayal of the U.S. government as peaceful when the U.S. puts its strategic bombing fleet on 24-hour alert status and sends three U.S. carrier groups to concurrent deployment off the Korean peninsula. The USS Ronald Reagan (CVN-76) will be joined by the USS Theodore Roosevelt (CVN-71) coming from the east, as the USS Nimitz (CVN-68) comes from the west in a move that escalates tension in the region. These actions and others match with the rabid words coming from various quarters in the U.S. government. For example, Sen. Lindsey Graham stated in August, "if thousands die, they're going to die over there," and continuing, Graham showed where he meant by “over there”: "Japan, South Korea, China will all be in the crosshairs of a war if we started one with North Korea." Even more menacing have been Trump's own "fire and fury" comments threatening nuclear annihilation and holocaust on North Korea. Roy Wolff presented next. He emphasized the genocidal history of U.S. aggression on the Korean peninsula. He stated facts that are generally unknown about the Korean War (1950-1953) like, "every village and town in north Korea was destroyed! Every one!" and he repeated that "30% of the population of north Korea were killed, that's 3 million out of the 1950 population of 9 million." By way of example Wolf talked about the north Korean city of Wonsan, "a city of 70,000 people (in 1950) was shelled for 800 days in a row. At the end of those 800 days, only one wall of one building was left standing....and there were no people...many had fled, but thousands were killed." Wolf also showed that while the 1953 Armistice temporarily ended the 'hot' hostilities, it did not end the brutality of the continuing U.S. occupation of south Korea, which meant that U.S. military personnel committed 100,000 assaults, rapes and murders between 1953 and 1995. The last speaker, Christine Ahn pointed out that "if there was ever a need for a mass mobilization in opposition to Trump and prevent a war on north Korea, it is now!” She argued that conditions appear to be good for developing movements both in the U.S. and in south Korea, with 68 to 80% of people in the U.S. opposing military action against north Korea, and over 80% of the people in south Korea wanting peaceful reconciliation with north Korea. There will be a nationally coordinated week of actions Nov. 6 - 11. This week of actions in the U.S. will mirror similar protests in south Korea. The Minnesota Peace Action Coalition will follow up on this forum with their No U.S. War on North Korea protest on Thursday, Nov. 9 at 4:30 p.m. in front of Senator Amy Klobuchar’s office at the intersection of Washington Avenue and Interstate 35W in Minneapolis.